It’s a perfect summertime activity for the entire family! Grab a beach blanket and some chairs, and enjoy popular children’s movies under the stars. On Friday, June 15th, Jumanji will be shown and on Friday, June 22nd, Moana will be screened on the lawn at Temeku Hills Park in Temecula. Festivities begin at 6 p.m. and the movies start at dusk. 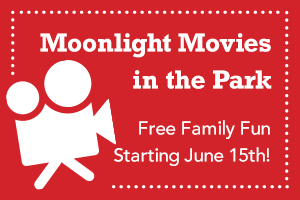 Moonlight Movies in the Park are free family events, so don’t miss it! This entry was tagged audie murphy ranch, brookfield residential, City of Menifee, Menifee Events, menifee new homes, menifee real estate. Bookmark the permalink.